One of the best things about credit card points and frequent flyer miles is that by using them, you can experience some incredible and luxurious travel that would otherwise be totally unaffordable. The catch is that it usually takes advance planning (and some flexibility), but it’s easy to find the availability you need with enough lead time for a big trip. I began planning this unforgettable around the world trip for my wife Erin and I back in June 2016. There’s no denying the trip took a lot of thought (and just a few seat availability searches! ), but I had a blast piecing it all together. After all, this was going to be the trip of a lifetime with the number of different places we would visit (many of them new for us), and of course…together we were going to try some of the best first class products in the world! Below is a summary of our trip. Bottom Line: The out-of-pocket cost of flying in these premium cabins came to less than half the price of economy tickets for the same flights. Arrived in Singapore and took ferry to Bintan, Indonesia for 24 hours. Stayed at Banyan Tree Bintan. Thanks to the long lead time, I was able to be strategic and get way more for fewer points! Erin knew we were flying Singapore Suites but had no idea about all the other flights…and boy was she in for a surprise! She also didn’t know we were staying in Bintan or Dubai; in fact, she didn’t really know much of anything we had planned for the trip! Although I started planning the trip more than a year in advance (in September 2016), I had all the award flights booked by the end of January 2017. That meant everything was done and dusted about 9 months in advance. For a trip this complicated — and any time you’re looking for premium cabin award seats for more than 1 person — that timeframe is normal and strongly suggested. My idea for this trip came when I decided I wanted to visit my oldest brother Stu, who lives in Vietnam. Sadly, I hadn’t seen my big brother since Erin and I got married in May 2014, so this was long overdue. And thus began this entire process! Besides, if seeing my eldest brother and some of our dearest friends again wasn’t motivation enough, as a points-and-travel fanatic I obviously wanted to try more of the most luxurious airline products available. Once I knew where we were going, I made a shortlist of the airlines I wanted to fly. To kick things off, I knew we had to get to Vietnam. 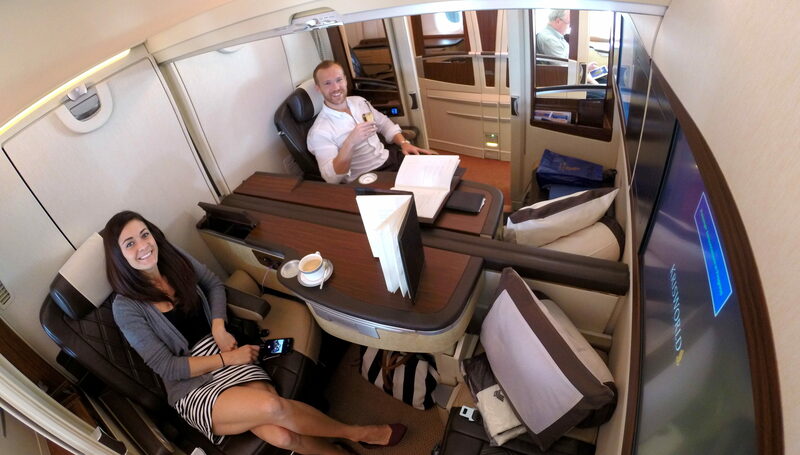 Since we also wanted to stop in Singapore, flying Singapore Suites was absolutely the way to get there! Singapore Airlines flies out from JFK on the A380 (the only plane that has the Singapore Suites product), and the route stops in Frankfurt before going on to Singapore. This long trip means you can completely enjoy the full experience for 92,500 Singapore KrisFlyer miles plus $296.73 per person in taxes and fees. That is an astonishing value, and way less than the price of coach. (This has changed since our flight: the miles required are now 120,000, but the taxes and fees are only ~$50). Traveling to Australia from Vietnam is not challenging, and after searching on Google Flights to see which airlines fly that route, I realized Singapore Airlines was on that list! This created the perfect opportunity to try their business class product, which I had been anxious to do ever since they recently retrofitted their fleet of Boeing 777’s — everything was new and fresh! Further, I had enough points to cover it because I could transfer from either Chase Ultimate Rewards, American Express Membership Rewards, Starwood (SPG), or Citi ThankYou. I chose to move points from my Chase account. Note: Starwood Preferred Guest (SPG) has since this trip been combined into with Marriott Bonvoy. I was really set on flying Etihad Apartments and Emirates First Class, so I got researching and that’s when the ultimate duo presented itself. Now, there aren’t actually that many routes where you can fly the Etihad Apartment, since that specific product is only on the A380 (just like with Singapore). This narrows down your choices: the A380 does fly back from Abu Dhabi to JFK, or you can fly from Sydney to Dubai. Emirates also flies to Dubai from Australia, so we could have done Sydney > Dubai on Emirates, and then Abu Dhabi > JFK on Etihad, but at the time of searching there wasn’t availability on our required dates. Remember, finding spots for 2 people can be a challenge! Instead, I decided to search for availability from Sydney > Abu Dhabi on Etihad (A380) and then Dubai > Los Angeles on Emirates (one of the longest flights in the world!). This was more than ideal, because the 16-hour+ journey on that latter route would be on my 33rd birthday! What a celebration that was going to be: flying in the sky spoilt with champagne, caviar, my own suite, and onboard showers! I also wanted to fly on their A380 for a couple other reasons. On the 777 there are fewer seats for a more exclusive experience, but there isn’t a bar or a shower…and that’s just nowhere near as fun! From that point on, it was just a matter of booking our flights. Tip 1: There are a few different approaches to planning a small or a big trip. Either you can decide that you really want to try a specific product and see where they fly, or you can pick your destination and then work the flights around it (I like to do this). Tip 2: Take stock of your points and miles and think about what you’re capable of earning between now and when you need to book your trip. You obviously want to avoid situations where you’ve booked 1 or 2 flights already, but can’t make that final booking as you’re short on points! Tip 3: If you’re looking to make a booking soon and don’t have time to collect additional points, make sure you understand exactly what you can get for your stash. For example, if you have Chase points, then do your research on what they can get you (and which airlines they transfer to). Tip 4: Picking the destination first reduces your options, which you actually want to do…otherwise it can all be so overwhelming and very time-consuming. If you want to fly a specific product, you must initially check which plane model that product is on. For example, the Etihad Apartment flies only on the A380, and by looking at Etihad’s website I could see their A380 routes. After I discovered that Etihad doesn’t fly an A380 out of Melbourne (but they do from Sydney), that meant that we would fly from Vietnam to Melbourne first (to see our friends) and then on to Sydney to see our other friends before taking off to Abu Dhabi on an A380. That made the journey much more efficient, rather than flying to Sydney initially, then to Melbourne, and then back to Sydney! Tip 5: I use Google Flights a lot to see which airlines are traveling on specific routes. From there, I can make a decision on booking award flights. For example, when looking at how to get from Vietnam to Melbourne, I just put that route into Google Flights and within seconds saw that Singapore Airlines was an option. That’s when I decided to book business class on that flight — it really was just that easy. There’s no doubt this trip took a lot of planning…but I had so much fun doing it, and the memories will truly last a lifetime. It was so special to see my eldest brother in Vietnam, treasured friends in Singapore, Melbourne and Sydney, and take some time to relax time in Dubai with my lady. Of course, I also loved seeing Erin’s face every time I surprised her with our next flight and destination! The intent of this post, and what’s to come, is to really show that you can book your destination of a lifetime using points. You don’t have to be obsessed (like me!) to make it work; any of these flights are possible with the right planning. How did you pay for the hotels? Did you utilize Mandarin Oriental’s “Fan Club” to get some of its perks? @Chris – hey! We paid for our hotels with cash but for all reservations we leveraged Virtuoso benefits as we have access to a rep. The benefits are essentially the same as those offered within Amex Fine Hotels & Resorts. AKA they were awesome, and we managed to snag upgrades on all our stays! Love this article Alex. Really appreciate how detailed it is showing exactly what route and product you flew, the route you took and how you actually booked it. Nicely done! Essentially, they are very similar to the benefits offered by Amex Fine Hotels & Resorts – however you need to know a Virtuoso agent to leverage them.